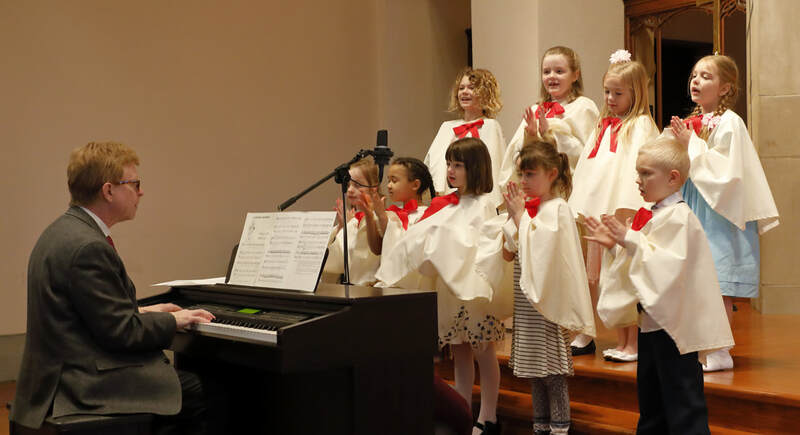 CHURCH MICE is our music experience for infants to Kindergartners, based on the early childhood development program, Music Together, from Princeton, New Jersey. Through music, actions, instruments and activity, children learn many life skills and gain knowledge. The program for children and their parents, grandparents or caregivers meets on Saturdays at 11:00 a.m. You are encouraged to invite friends and neighbors in your play groups to join in the fun. Church Mice is a great way for young families to enter into a fuller church life. CHILDREN'S CHOIR is for those in kindergarten through second grade. We meet on Tuesdays, beginning February 12, 2019 at 4:45 p.m. and perform during the Advent Celebration and several times during the year at the 10:00 a.m. service. WESTMINSTER CHORISTERS is made up of singers in third through sixth grades. We rehearse on Wednesdays, September through May from 4:45-5:15 p.m. following Bridges. Choristers sing for worship each month. We also take part in special musical presentations, and we perform a musical each spring.